I am a big fan of potatoes. 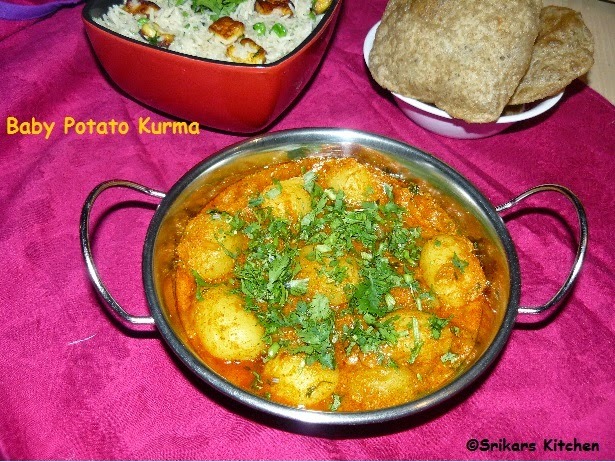 This baby potato kurma has a tangy savoury taste & best side dish for all types of roti. Ideally this can be done with normal potatoes but cooked & peeled new potatoes give great flavour & amazing look. It can be good for rice dishes. Boil the potatoes & deskin it. Heat oil in a pan, add cardamom,cloves,bay leaves & allow to sauté & add sliced onions. Add the paste 1, redchilli power, turmeric powder & mix well. Add chopped tomatoes & Mix well. Add water & allow to boil. Add boiled potatoes & mix well. Add paste 2 & mix well. Garnish with Cilantro. Delicious kurma! Love these baby potatoes!